San Marino model with 2490 sq.ft. 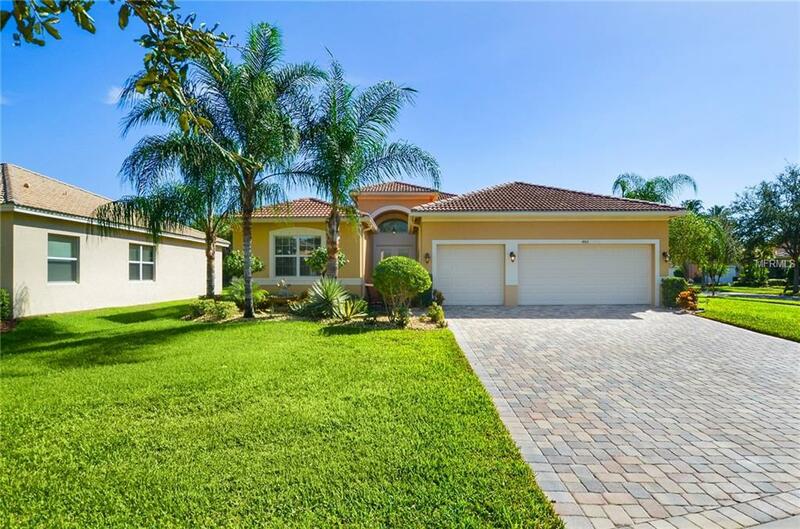 4 bed / 3 baths and 3 car garage, Located on an over-sized corner lot that backs up to mature landscaping to provide privacy while lounging on the private extended/screened lanai. Step into this open floor plan with stunning bamboo flooring in all living areas, den/ 4th bedroom andmaster bedroom. The designer touches include wood trim accents, crown molding, neutral dcor and more! The great room is open to the dining room and gourmet kitchen with large sliders bringing the outdoors in. The gourmet kitchen is upgraded with beautiful stained maple cabinets, under and over cabinet lighting, granite counter tops, a custom center island for more storage and prep space, stainless steel sink, back splash, and upgraded stainless appliances. The master spa has dual sinks, granite counter tops and a walk in shower with upgraded wall tile. In this split bedroom plan the 2nd and 3rd bedroom have a convenient jack and Jill 2nd bath for privacy for guests. The 4th bedroom can be used for a den or bedroom and has it's own 3rd full bath. The laundry room has a utility sink and front load washer/dryer. Ask about the furniture too! Come see for yourself all the reasons to make this your Florida oasis where you can vacation every day. Located in Valencia Lakes, Florida's premier 55+ community with incredible amenities! Relax by the pools, exercise, spa/ sauna, join clubs, eat at bistro, play sports, and live where it is almost impossible to be bored. The perfect place to call home!